Finished last evening. 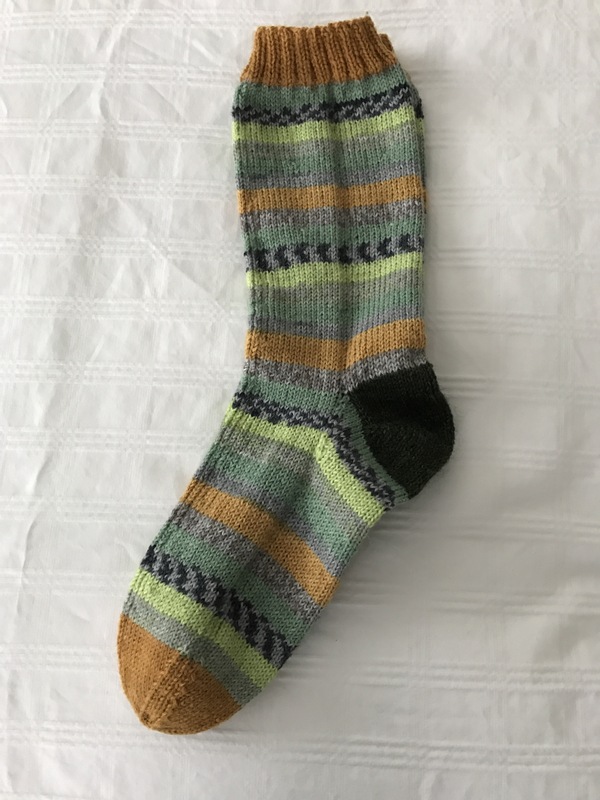 I had intended knitting the heel with the golden yarn I used for cuff and toe but given the spot where the second gold stripe on the leg showed up, I thought a contrasting heel would be more interesting so I dug through my yarn stash and came up with this dark green (almost dark grey). 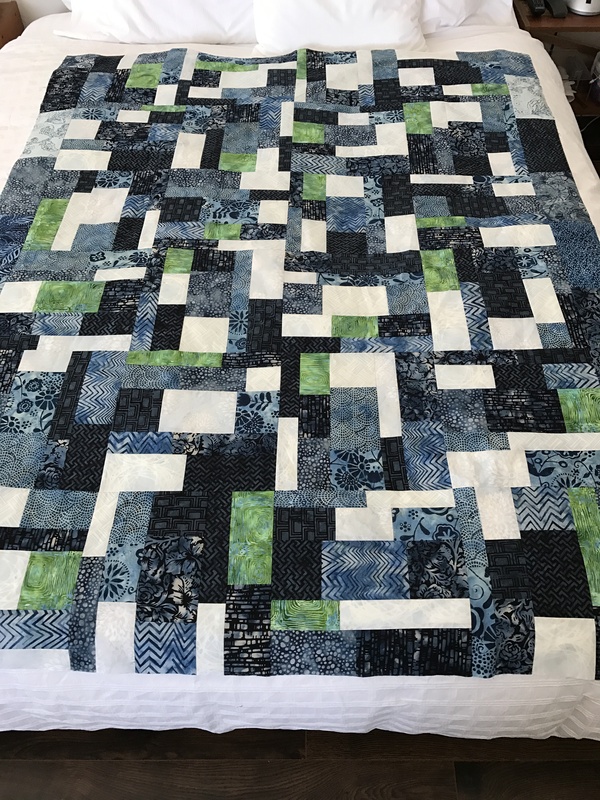 I mused about the teal/indigo fabrics I had for a couple of days and decided in the end to limit the quilt to just the set of twelve fat quarters (I put the rest away). 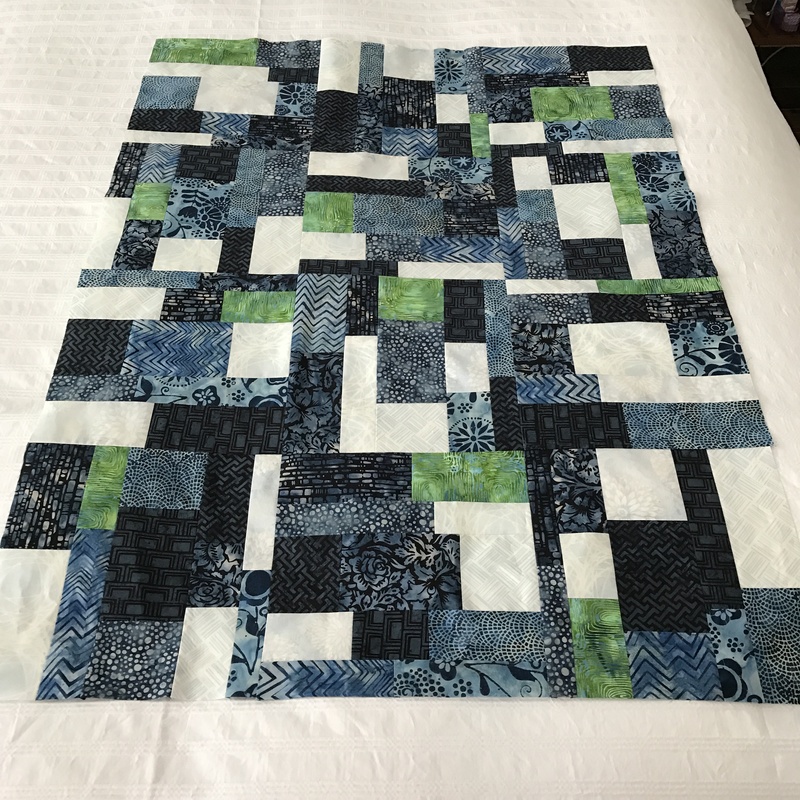 To use my set of twelve indigo fat quarters, I decided to make a 12 x 12 quilt based on Elizabeth Hartman’s “Low Volume Tiles” quilt from her Craftsy Class: “Inspired Modern Quilts“). 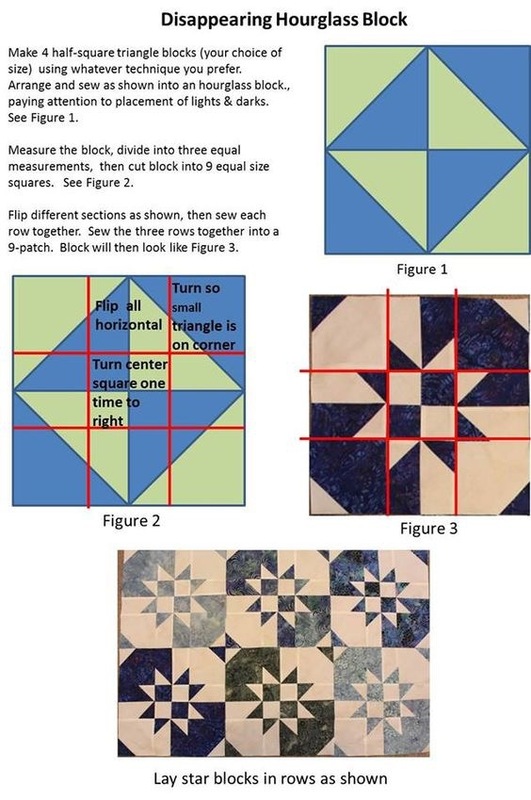 I based my quilt on Hartman’s design but had to adjust the sizes of my small blocks because once I cut the first 13″ square I knew I had to fiddle to cut a second set of 12 blocks – there wasn’t enough fabric for a second 13″ square. So the dimensions of my small blocks are a bit different than hers in order to be able to use the fabric I had – there was just enough with a 5″ x 8″ leftover piece of each fabric which I used in my side borders. When you’ve done the setup, each stack has 12 fabrics, arranged so that a different one of the 12 fabrics is at the top of a stack before you begin laying out the large blocks and the fabrics in each stack are in the same sequence, just shifted by one so when you sew the blocks, each block has all 12 fabrics with no repetitions! That’s a small quilt, however. 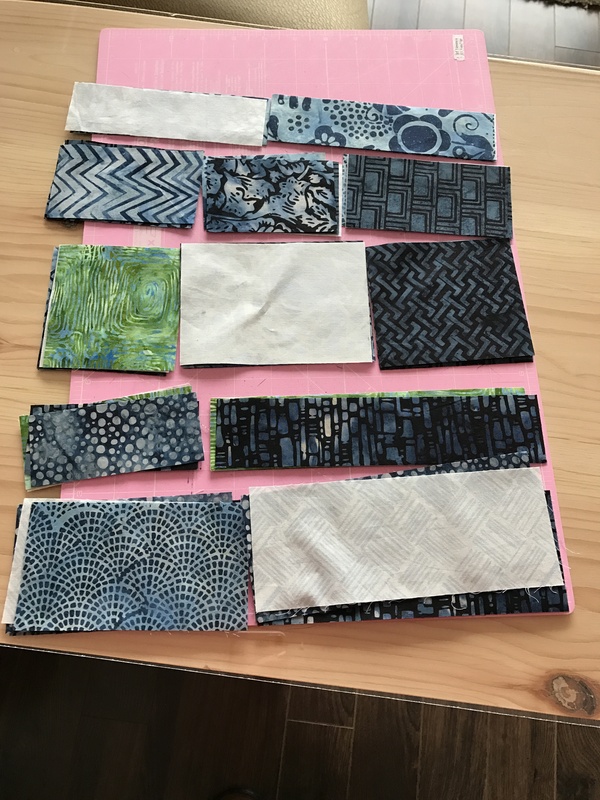 I had cut a second set of 12 small blocks from the residual fabric from my indigo fat quarters – so I stitched together the second set of twelve blocks. 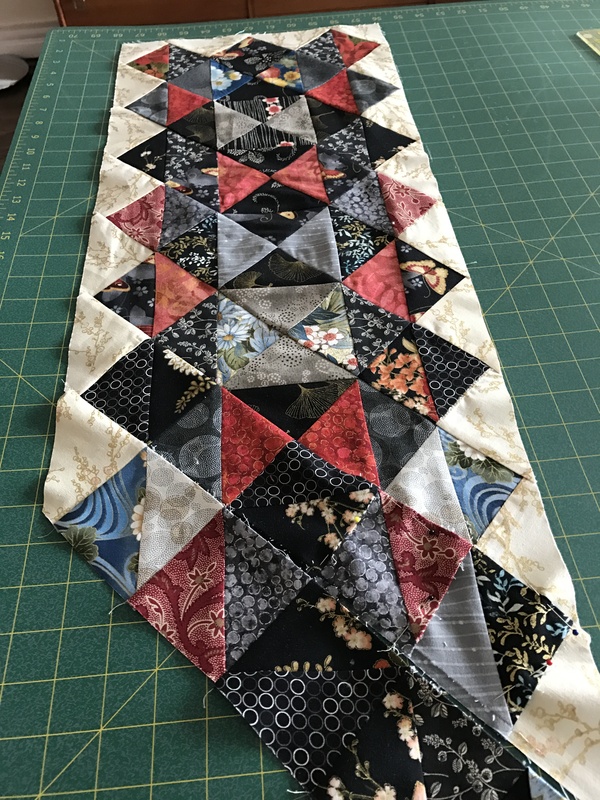 It turns out that I was lucky to have chosen 13″ as my starting size because I wouldn’t have had enough fabric to create the second set of 12 blocks had I started with 14″! 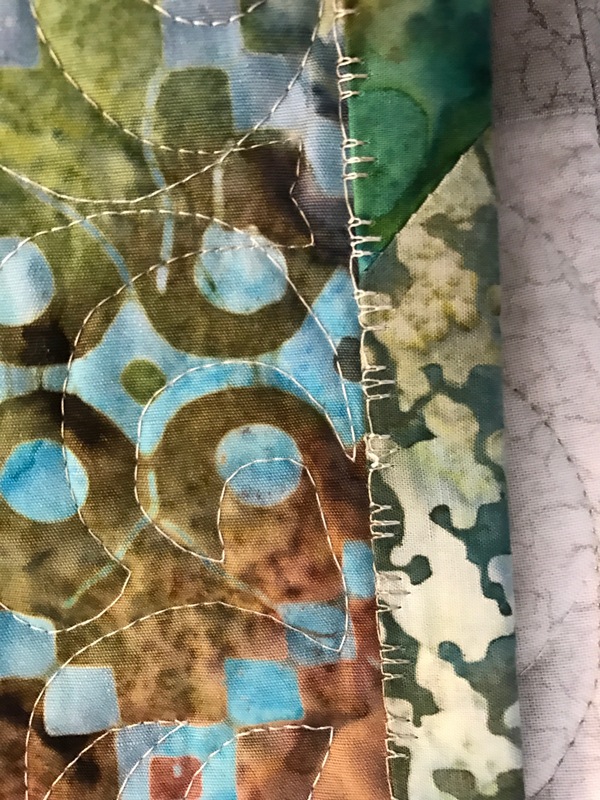 One other thing – I removed one of the light fabrics from the collection before I began cutting, substituting a bright green for block #12. I wanted one colour to pull the other fabrics together. 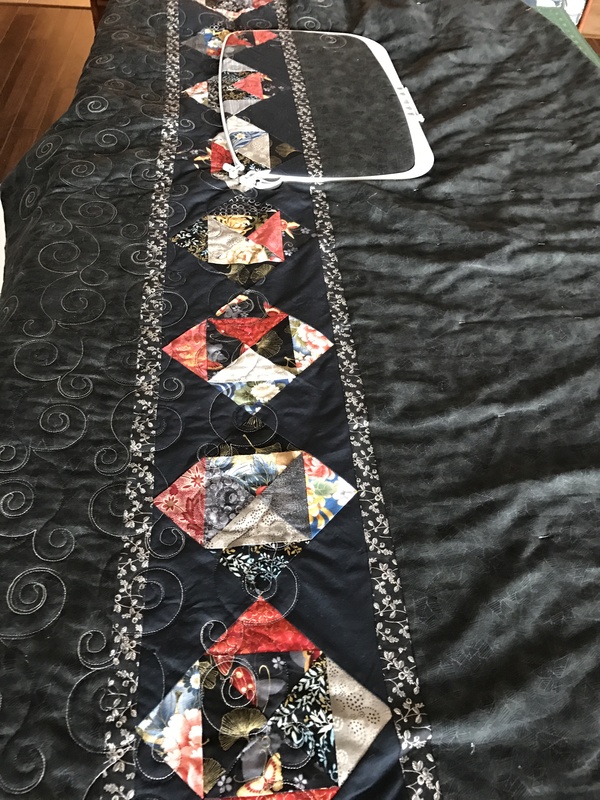 My finished quilt top is a 4 x 6 array with added 4″ side borders to give me a final width more in proportion to the length. Finished quilt: width 50″; length 64″. I lost a tiny amount from both width and length with the trimming I did in order to able to fit the blocks together. 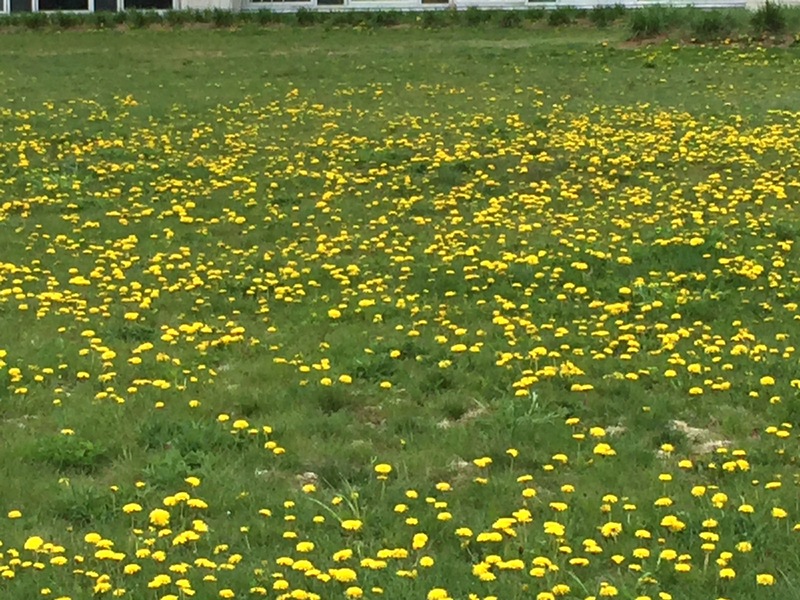 But in a design like this you can’t tell where the trimming occurred. You really aren’t able to see the “blocks” or where the main joins are. Now to come up with an idea for the back. 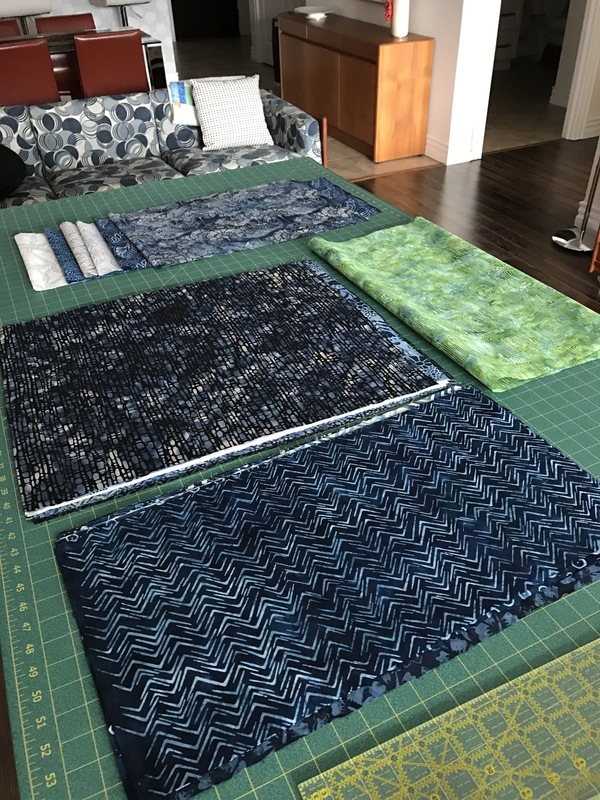 Yesterday I bought some backing fabric and 1/4 m of four teal/indigo batiks to add to some others I have but didn’t use in the quilt top. 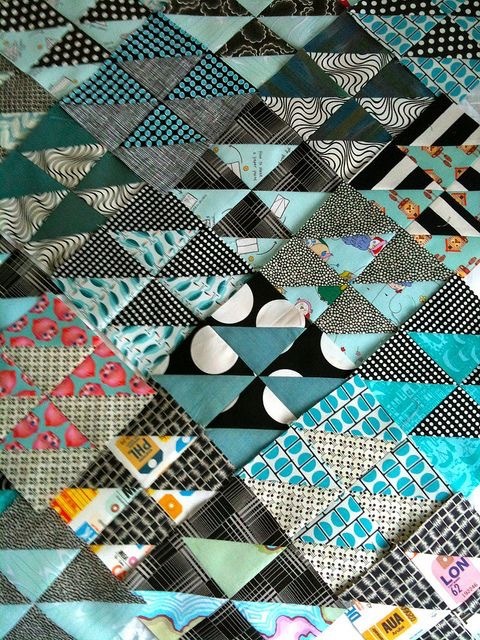 I had to do that because I didn’t have a single scrap left from the original fat quarters I started out with. Nearly two years ago I returned from a road trip to Toronto via Center Harbour Vermont so I could visit the Keepsake Quilting shop. I’ve been buying fabric from the online shop for years. This was a chance to actually see the entire selection. I was looking for green batiks to make a quilt for Noah. 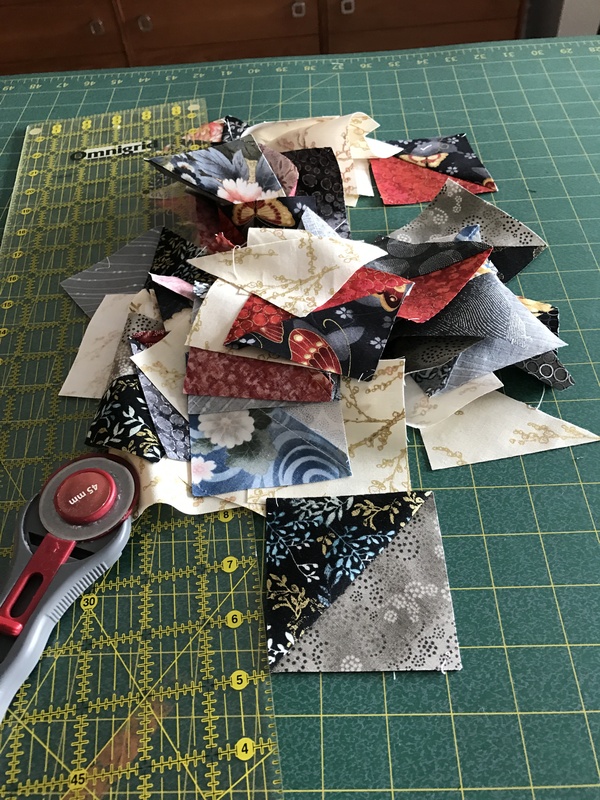 However, once I’d made my choices, I couldn’t help looking around and ended picking up two different fat quarter collections of indigo/teal – eighteen pieces of fabric in all. 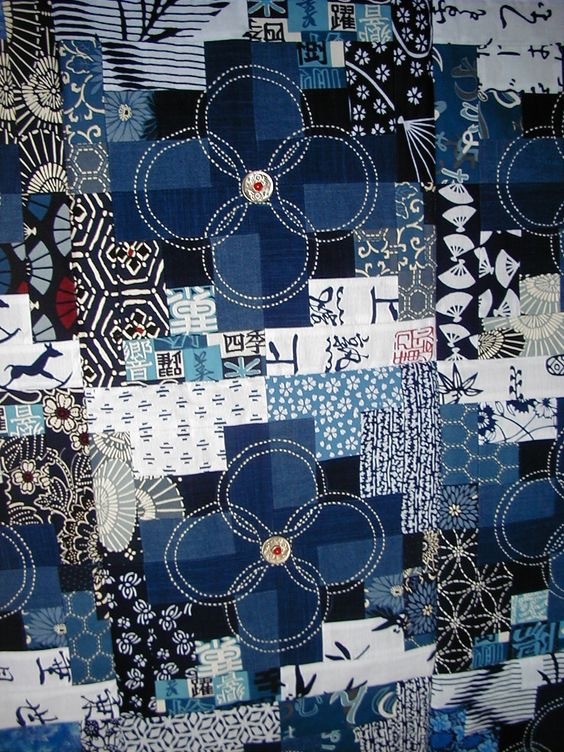 Having just finished the Japanese Strip Quilt, I was looking through my stash and decided it’s time to use these indigo fabrics so I opened the packages, spray starched and pressed each piece. I realized I didn’t have enough light coloured fabrics so I made the rounds of my nearby fabric shops and bought several 1/4 m selections. Now the prepared fabrics are sitting on my cutting table – along with a 1/2 m length of a bright green to use as an accent. 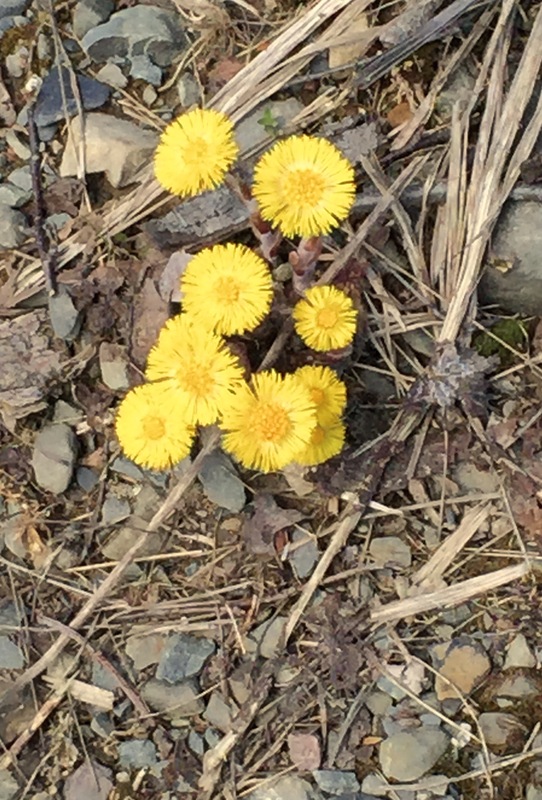 I just have to decide what to do with them! I want something “modern” but probably constructed using traditional elements. Can’t make up my mind, is the problem. 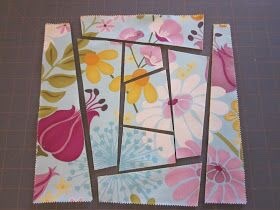 I could cut squares, stack them three/four at a time, wonky cut them, and sew, mixing and matching to create blocks. Or I could just cut and sew, improvising as I go along! Don’t know where to start yet. Here it is – the finished, bound quilt (just a label needed – I’ll do that later this afternoon when I get back from some errands). I did the quilting from top to bottom in line with the strips, instead of across the quilt. I wanted to emphasize the flow of the piecing. 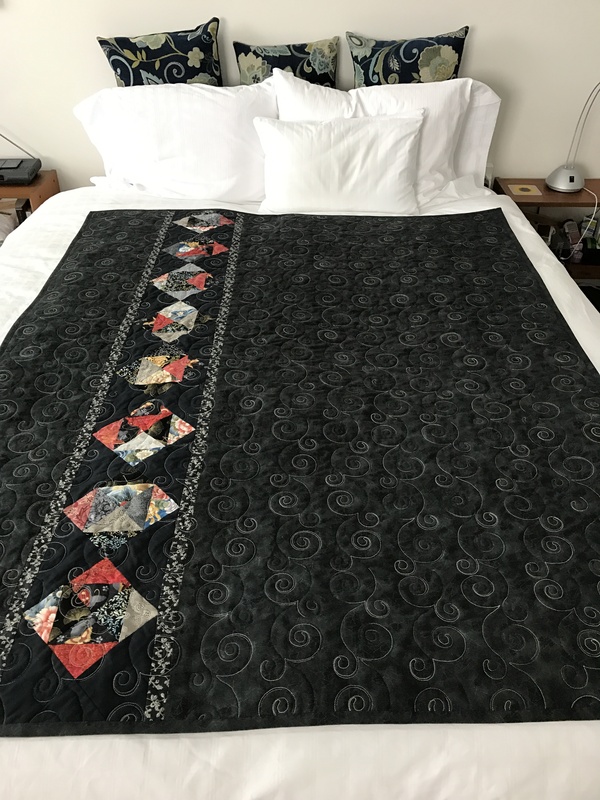 I was lucky my quilting design was the perfect size for the side borders and fills that space nicely (It was pure luck that I was able to balance the border quilting on each side!). It took a lot of precise positioning to make the embroidery joins work but it would take a hawk eye to detect the slight misalignments I decided to live with. I used a variegated white/grey/black thread, top and bottom and I like how it turned out on the back. On the front, the stitching blended well with the coloured strips. However, I darkened the light stitching in the dark strip ends because otherwise the alternating strip ends were obscured and that was a detail I worked hard to achieve. The back has worked out well. The pieced insert brings colour and interest to the back. The side borders of the strip blend well with the backing fabric yet effectively set off the insertion. I used strips of the backing fabric (which I had found in a second shop after I’d pinned the sandwich together) for binding. 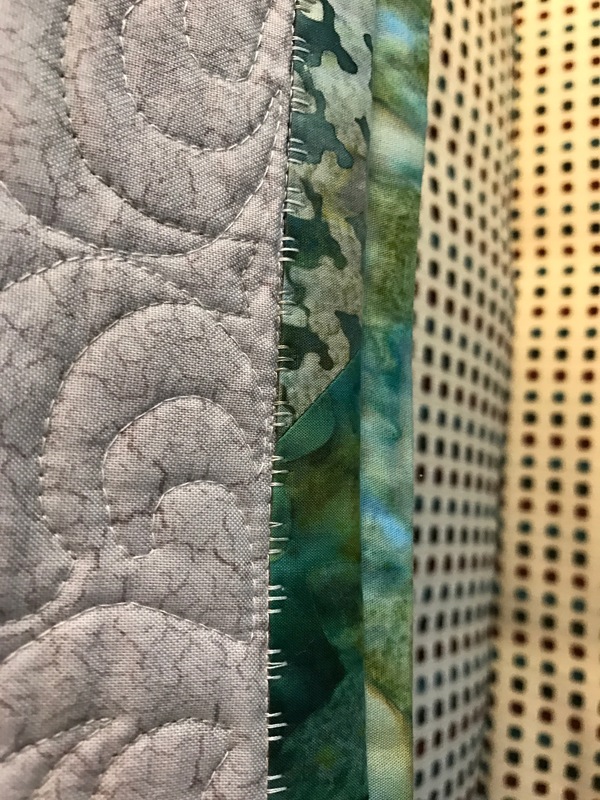 I’ve finally learned 2 1/4″ binding strips are better than 2 1/2″ – I have less fabric to fold under on the front of the quilt – easier to manage when I’m pinning the binding in place on the quilt front after first stitching it to the back. 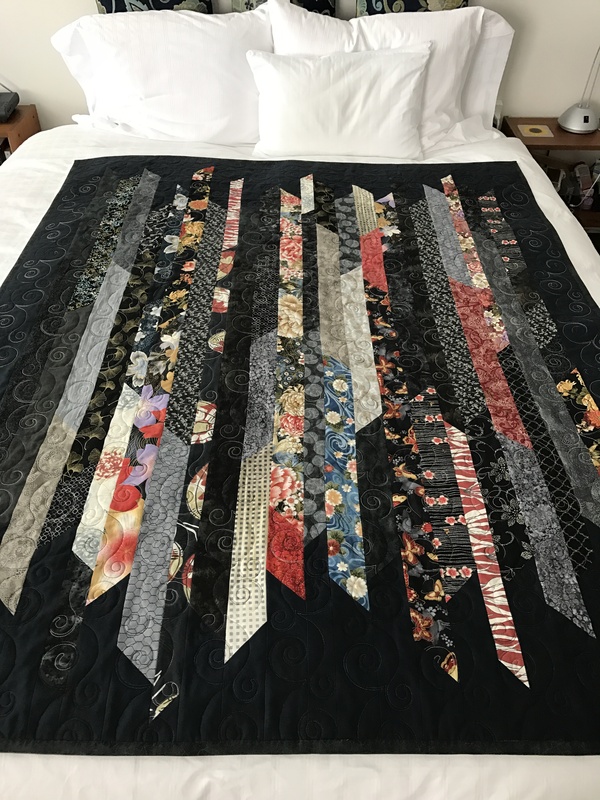 I would have liked the quilt to be a wee bit longer but I was limited by my original 66″ length of backing fabric – all that was left on the bolt. The quilt is still a respectable 62″ long.